How was your weekend? Mine was pretty good. We had some friends over and played a few board games. My hubby picked one up at Toys R Us called Telestrations. I had never heard of it before but it's like the game telephone combined with pictionary. Which leads to some hysterical drawings!! In he Clean and Simple 2 card class they talk about one layer cards. I personally love one layer cards. I think it's a great challenge to keep them interesting with zero extra layers. I decided to mask off a square and stamp Hero Arts Stencil flower, I haven't used this baby in forever! I made my square 3.25 x 3.25 because the whole stamp measures 3.5 x 3.5. Once I stamped my flower I also masked it to stamp my leaves. I removed the flower mask but left the border mask in place. Like the wonderful Jennifer Mcguire I love the idea of being a watercolor artist, I just can't paint :) I used picked raspberry, mustard seed, and peeled paint along with my water brush to color the images. I love the kind of fuzzy edges it gave once the mask was removed. I stamped my sentiment, colored the center with a medium brown copic and added some stardust stickles to complete it. I really love how it turned out and think it would be super fun to do a set like this. Maybe to give as a gift . . .hmmmmm . . . that's an idea! Stunning card, Kelly! LOVE the beautiful colors! I am sooo ready for spring too! Beautiful card with amazing colors! I am sooo ready for spring!! Absolutely stunning! A luscious design, love the way you did the masking. Really gorgeous, Kelly! 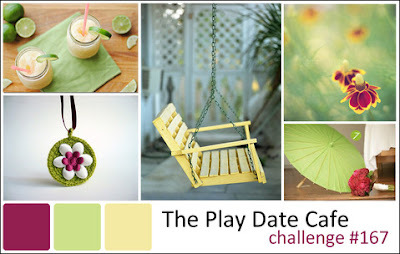 Stunning card, Kelly - congrats on you honorable mention in the Playdate Cafe! WOW, This is so gorgeous.